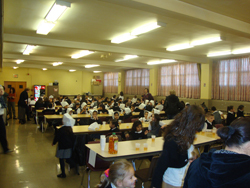 On Wednesday, November 24, 2010 a tradition at Assumption Catholic School continued. What begin several years ago as a simple gathering to give thanks to God together as a school, has grown into a real Thanksgiving Feast. The day started with Divine Liturgy, continued with entertainment related to Thanksgiving, and finally dinner was served! 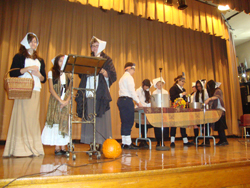 This year students in the Senior Drama Club took classes on a pilgrimage around the school to learn how the original Pilgrims left the life they knew to take their chances in the New World. Pilgrim Guides led groups from room to room where they met pilgrims to find out about why they left with their families. The heard of what life was like on the Mayflower and what the first government was after their arrival. The last stop of their pilgrimage took them to the auditorium where they learned of how the Pilgrims and Native Americans prepared for the first Thanksgiving as well as how Thanksgiving came to be a national holiday today. Once all groups had the opportunity to go on the pilgrimage it was time to eat. ACS faculty and students were joined by invited members of Saint Ann Society, Holy Name, Bingo workers and the Senior Citizens Club. Many parents, including the FSA board, under the direction of Mrs. Derevenska, our kindergarten teacher, prepared and served a full Thanksgiving dinner. Cornbread was prepared by grade four. Sister Maria and the second grade prepared fresh cranberry sauce. Homemade pies were prepared by student in grade six, seven, and eight. At the end of the day the seventh and eighth graders helped to clean the cafeteria and auditorium. Extra plates were prepared by the kitchen workers and delivered by Father Ivan and a few eighth graders to nearby parish members. Thank you to everyone involved in making the day such a special day!